These retirements are due partly to the end-of-life of some products (vRA 6.x for example), but also to the alignment of certifications with year branding. Slots for these exams will start to run out in the next few weeks, so book up now if you want to take them. All available exams and certifications are detailed on VMware’s certification page. If you want to check the list of retired or retiring exams, the document detailing those can be found here. 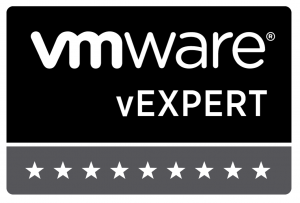 Last week the VMware education and certification team released the VCAP6-CMA Deploy exam. This is a lab-based exam intended to test a candidate’s knowledge of how to deploy and administer vRealize Automation (also in conjunction with Orchestrator, Business Standard, Application Services and vCloud Air). It’s the next tier up from the VCP6-CMA exam. The blueprint and exam registration link can be found on the VCAP6-CMA exam page. It’s also the the day after the night before for some, and hence often quieter first thing in the morning (as was the case again this year). For some reason, all of the sessions that I had originally planned to attend, and already had in my calendar, I had been unregistered from and several I couldn’t get back into. I did manage to squeeze into a session about the inner workings of EVO:RAIL (SDDC1337 – Technical Deep Dive on EVO:RAIL) that provided some useful background for me. I like the idea of where VMware (and their hardware partners) are going with it (there are definite pluses), but the current 16 host limit per vCenter and allegedly higher cost per appliance compared to other converged hardware offerings might be off-putting to some customers. Humorously, some of the questions asked at the end of the session indicated that quite a few people still don’t quite understand such converged hardware solutions – it’s clearly a growth area. Unable to get into the sessions that I wanted, and with time before my flight back running short, I called in at the certification area to ask a few questions around forthcoming certification updates. I’m looking to complete the VCAP CID and CIA exams but I wanted to know about when they’ll cover vCAC (I mean vRA) 6.x. No firm answer on that sadly. One final thing I managed to squeeze in was a stop at the vGiveback area to build a paper aeroplane. If you missed this or are wondering what it’s about, vGiveback was a challenge area where attendees could build and throw paper aeroplanes to earn charity donations that VMware will make after the conference ends. Sam McGeown had found a design that was capable of doing the distance to the €1000 zones. Sadly, it was getting the plane to fly in a straight line that was the problem. In the end, it was only a €30 plane but every little helps. I’m not the world’s biggest fan of exams and I’ve been putting this one off for a while. But, after Gregg Robertson volunteered me (at VMworld Europe) to pursue VCDX in 2014, I thought I ought to get it scheduled. I took the VCAP4-DCA back in 2011 and became the 189th person to pass it. You would think then that the VCAP5 wouldn’t pose a big issue. I was concerned though that I spend more time now using tools like Word and Visio than I do mucking about in the vSphere Client. Turns out that I needn’t have worried quite so much. The two exam blueprint areas that I knew I was weaker in came up as tasks and I left them until the end to give them as much time as I could without jeopardising my chances on the other areas. That way I knew that if I messed them up, at least I’d given the rest of the exam a good go. My tip for taking the exam: Before you start it, use the mini whiteboard or notepad that the exam centre give you to make a numbered list of the tasks that you’ll be doing. As you do each one, tick it if it’s finished or annotate what needs doing of finishing for each one to allow you to move through the exam without waiting for all tasks to complete as they can be slow and you can’t afford to waste time. Whilst doing the rounds in the VMworld Solutions Exchange, I got into a conversation about VMware certifications on VMware’s stand. I was there for quite a while and learned a lot about how VMware choose questions and tasks for their exams. It’s quite an involved process and one designed to ensure that a certain percentage of people sitting the exams are capable of answering each question. Each question must be carefully considered and researched by a small panel of people before it is submitted in to a pool from which the exams are built. In the case of the VCAP-DCA exam, extra effort is required to automate the creation of a suitable testing environment / conditions for the task and, where possible, a mechanism for automatically marking those tasks is required. So, all things considered, it shouldn’t come as a surprise that exam development and release can take some time. Indeed, when I pressed for a VCAP5-DCA exam release date I wasn’t given a direct answer. It will take as long as it takes to get it right. There was, however, a strong feeling that it should be possible to sit the exam (or at least book it) before the year is out. I am so glad it’s over. It’s been a long time since I took an exam where I had to wait for the results. Maybe even 14 years! Even then though, I knew the exact date when the results were due. With the VCAP-DCA, VMware say that you’ll get your score within 10 business days. That’s not too precise (although thankfully not too long either) and in the end it was more like 13 business days since I actually took the exam. There’s a limit to what I can and will say about the exam. Three and a half hours didn’t seem like nearly enough to get through it all – I ran out of time. A contributory factor in that though was the equipment / environment used to deliver the exam. I am used to working with a certain amount of screen real-estate and I lost a bit of time working with the 1024 x 768 display that I had. If you’ve ever tried using the vSphere Client on such a display you’ll appreciate what I mean. I can’t say much about the content of the exam. Cover off as much of the exam blueprint as you can and you should be ok.
Next up for me is the DCD exam. Or maybe the Desktop exams. There’s plenty to do! Well, that one objective dealt with. Just another 30 odd to go. Don’t forget that reading is not everything, you need to have done as much of this stuff as possible. There are links to VMware’s product documentation throughout, be sure to be familiar with it as the language and methods that they use there should be the same as you’ll find in the VCAP exam – I hope. To put an application into a virtual environment you must first understand its I/O requirements to make sure that it will perform adequately on the storage that you have configured. This is very much like the process of determining how much CPU and Memory resource an application will need – it’s a necessary step. Of course you can miss it out and in the majority of cases that won’t be an issue but to keep your finger on capacity management and to avoid possible problems it is best to follow a defined a repeatable set of steps. It’s also useful to be able to profile the I/O workload of applications already on a virtual platform. So, what do we need to know? Well although I have a fairly well-rounded set of skills, I am more of a Microsoft guy than a Unix guy. As such I’m better at looking at I/O on Windows systems than anything else. Obviously this is something that I need to address a bit but it’s not exactly in the scope of this post. Kevin Kline, a SQL MVP, has a short video hosted here that is targeted at physical SQL servers – the kind of load you’re likely to want to do this with. There’s also a good MS Technet article about determining the I/O requirements for Exchange 2003 that’s a useful read. Next up, I’d suggest having a look at SWAT. It’s Sun’s java based I/O monitoring tool. Also, get to know vscsistats. Scott Drummonds (a guru in this area) has a VMware communities page that is a must read. Next, read the useful posts by Duncan Epping (YellowBricks), Gabrie van Zanten (Gabe’s Virtual World) and Gabe’s other post on making the output data Excel friendly. What is LUN masking? explains what LUN masking is in layman’s terms (in case you have a NAS only background). See Storage Masking? for the Yellow Bricks advice on LUN masking. For an overview of PSA and commands, see VMware vSphere 4.1 PSA. Also see the vSphere CLI guide, vSphere Command-Line Interface Installation and Reference Guide.